Mold problems can be incredibly expensive to repair, sometimes requiring entire rooms being torn down to the studs. Certain types of mold can cause illnesses from skin irritation to obstructive lung disease. What is truly frightening about mold is how easily it grows. One study from the University of Arizona showed that 100% of the homes it tested showed positive for mold (1). 100%! If mold is so pervasive, how do we prevent it? Mold Audit Your Property: Start by doing an audit of your property for hazards. Do you notice any of the following? Look into the best fix for your problem(s). While some solutions can be simple, some may require more complexity and cost. Air Out: Moisture builds and accumulates in moist areas when there is insufficient airflow or ventilation. Make sure that you open windows in unoccupied properties regularly. Install high functioning fans and stove hoods to stem mold growth in the kitchen, laundry room and bathrooms. You may even consider adding dehumidifiers into your properties. Keep Water Away: It’s important to remember that buildings are susceptible to mold growth from the outside in. Think about where water accumulates around the perimeter and then direct it away. Use flexible extensions on the end of downspouts and alter ground cover choices. Remember to keep gutters clean to avoid pooling water at the roofline. Your Plumbing: While it is true that some leaks can be spotted and easily fixed throughout your home, many cannot. This is because much of plumbing systems remain unseen behind walls and underfoot. 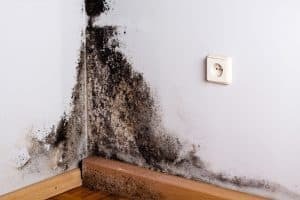 Major mold growth occurs frequently in properties with leaks that have been unaddressed for long periods, as the first warning sign is often a water stain or worse. Consider installing a leak detection system like AquaTrip. AquaTrip is a permanently installed system that constantly monitors the entirety of a building’s plumbing. AquaTrip saves money by curbing potential water damage, reducing excessive water bills and controlling the potential for mold overgrowth. You can learn more about AquaTrip by visiting buyaquatrip.com or call 1-844-4-AQATRP to find out how you can join the Pilot Program for savings up to 50% off! Golden State Flow Management (GSFM) is the exclusive distributor of AquaTrip leak detection systems in the United States. In bringing AquaTrip to market, we bring with us our twenty years of experience in the conservation, management and optimization of water and its revenue. We are proud of our legacy of providing superb service and collaboration to our clients. AquaTrip gives us a unique opportunity to leverage that experience within a larger market and to offer the property management industry a truly innovative and useful product.